We’ve known since January of this year, thanks to a study in the Chemical Engineering Journal, that pretty much everyone loads the dishwasher wrong. Researchers encouraged people to place their plates and bowls in a circle and based on the type of stain, with carbohydrates in the middle and protein around the edges. This doesn’t actually solve what most people fight about when it comes time to load the appliance, though. The biggest issue is whether or not to pre-rinse dishes. Sixty-one percent of those surveyed by Bosch in 2012 argue over this, because two-thirds of men pre-clean. Modern dishwashers and advanced detergents are actually designed to work best with stuck-on food (Cascade has enzymes that need to attach to food to work, for example), so it’s best to let the appliance do its job, while you kick back and relax. If something is really baked on, well, that’s what the pots-and-pans setting is for. Dishwasher makers are at least attempting to combat one of the arguments the machine sparks, the handles up versus down debate. 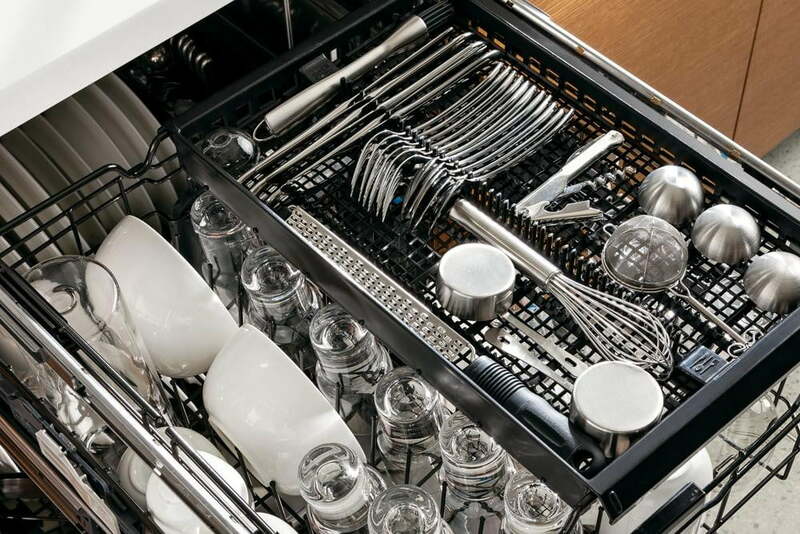 Bosch, LG, KitchenAid, and Samsung all make dishwashers with a third rack. Because knives, forks, and spoons all lie as they would in a utensil drawer, there argument is moot… unless you want to get into it over whether the handles should face forwards or backwards.